A 2-6-0 Baldwin style steam locomotive, built by Willis Light Engineering of Perth, Australia in 1993. She was imported especially for use at Watford and ran for 10 years, before being withdrawn for an overhaul. After completion of this long running overhaul, she entered service again in April 2018. A bogie diesel hydraulic locomotive, built as one of three identical locomotives in 1972 by Fenlow Engineering. She and a sister locomotive originally ran on a railway at Prestatyn beach, before moving to the Suffolk Wildlife Park (via Staffordshire) in the early 1980s. When the wildlife park closed their railway in the early 1990s, she moved to Watford and has been in regular use ever since. 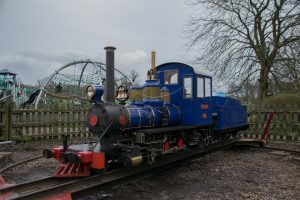 An 0-6-0 diesel hydraulic locomotive, Nikki Louise was built brand new by R. Prime for the Suffolk Wildlife Park in 1988. When this railway closed she moved to Watford with Conway Castle, where she was subject to an extensive rebuild before coming into use in the late 1990s. An 0-6-0 tank locomotive, Pilgrim was built in 1982 by David King in the Wells and Walsingham Railway in Norfolk. When replaced by a larger Garratt locomotive in 1986, Pilgrim was sold and then spent many years on a touring portable railway. Eventually sold to the Knebworth Park Railway in 2005, she ran there occasionally until undergoing an overhaul in 2013/14. 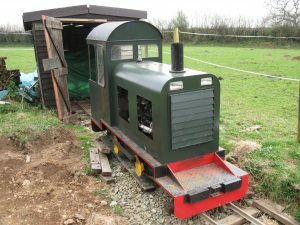 She was then placed on loan to the Wells Railway, but moved to us in 2019 to help celebrate our 60th Anniversary. Pilgrim is privately owned but we expect her to remain with us for the 2019 season at least. A 2-4-2 diesel hydraulic locomotive, originally built as a petrol locomotive by Bruce Whalley for a private railway in Somerset. 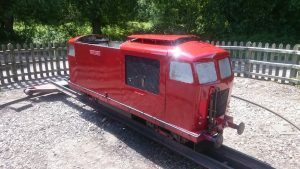 Following use on a number of private railways in the West Country, Bree was taken to our workshops for a thorough rebuild to suit use at Watford. An 0-6-0 American ‘Switcher’ style locomotive. Built in 1946 by R.H. Morse as 9½” gauge, she arrived at Watford in the early 1980s when she was rebuilt to our 10¼” gauge. Her small size belies the fact she packs quite a punch and can pull a full set of 10 coaches! Last used in 2007, she is currently undergoing a thorough restoration to put her back into working order. 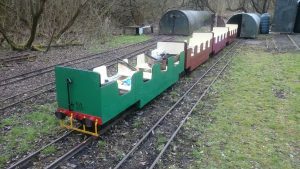 Our sit-in coaches are all built to the design developed by Ian Allan Miniature Railway Supplies in the late 1960s for their network of seaside miniature railways. 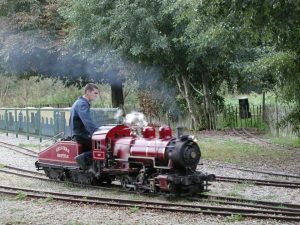 The majority were built for the Prestatyn Miniature Railway, and came to Watford via railways at the Kessingland Wildlife Park in Suffolk and Trago Mills in Devon. There are also coaches to a slightly modified version of the design from Whitby (slightly wider and featuring curved ends) and Sandham Castle in the Isle of Wight (slightly shorter). There are currently 19 coaches, permanently formed into three sets of five and one set of four. We also have some spare coaches in store off-site.